Three mega car rental companies will soon control the U.S. market, and a handful of airlines will do likewise. Consumer choice and competition is vanishing faster than free checked bags. Anyone remember when there was actually car rental and airline competition? Thank God for the fractured hotel market — at least there tends to be some consumer choice when comparing rooms from chains and independent hotels, although there is more competition in Europe than the U.S.
With the news last night that Hertz has agreed to acquire Dollar Thrifty for $2.6 billion, the US. car rental market, if the deal gets FTC approval, would come down to three major players controlling more than 60% of car rental locations and more than 90% of revenue, according to 2011 figures from AutoRentalNews [pdf]. Customers at a Hertz airport counter. Photo by Steven Damron. With the acquisition, Hertz would shed its Advantage brand, which only accounts for about 1% of the market, and would solidify its position as the No. 2 U.S. car rental company, still way behind No. 1 Enterprise, and moving further ahead of Avis Budget, which also had pursued Dollar Thrifty. Dollar Thrifty, with its mid-tier brands, would be contributing around 445 U.S. locations, and would round out the offerings of until-now corporate- and premium-oriented Hertz, which didn’t have a significant budget brand. The Hertz-Dollar Thrifty combo would command a presence of some 37% of U.S. airport locations. Overall, Enterprise had 6,187 U.S. locations, Hertz (including Advantage) had 2,500, and Avis Budget 2,300 in 2011, according to AutoRentalNews. The U.S. car rental market has been on a consolidation binge over the last decade, when there were nine brands that counted for something, and Dollar Thrifty, itself the product of a merger, is considered the last prize in the lot. In fact, Hertz reportedly agreed to buy Dollar Thrifty at $87.50 per Dollar Thrifty share, and that’s about double what it offered when it unsuccessfully tried to buy Dollar Thrifty in 2010. If the FTC approves the deal, then three mega car rental companies, Enterprise, Hertz, and Avis Budget would basically control the U.S. car rental market, which would further decrease competition and choice for business and leisure travelers alike. Hertz had been in talks with the FTC about a potential Dollar Thrifty deal even before the acquisition agreement, which may mean that the FTC’s concerns are allayed. 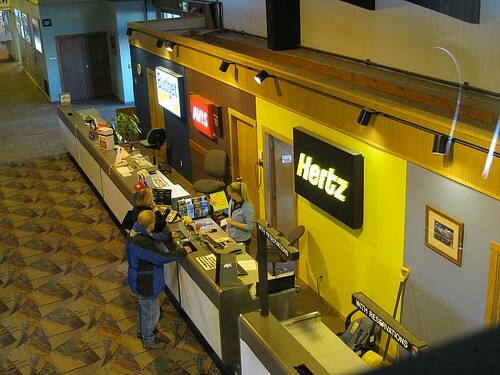 Hertz expects to close on the deal, pending regulatory and shareholder approvals, by October. This increased consolidation in the car rental market occurs as similar doings are taking place in the domestic airline market. If American Airlines and US Airways end up merging, then just four U.S. carriers — American Airlines/US Airways (21.1%), Southwest/AirTran (18.4%), United/Continental (16.6%), and Delta (16.2%) would account for more than 72% of domestic revenue passenger miles, according to the Bureau of Transportation Statistics. With this merger fervor in the U.S. airline market, competition from low cost carriers such as JetBlue and Virgin America is definitely a factor, but it is becoming increasingly a side show. Rising airfares and decreased capacity have been the rage among U.S. carriers in recent years, and the relative lack of competition means travelers have to basically go along with it — or take the bus, train or car. And, now car rental choices and competition will also get increasingly squeezed.